Will Hodson, aka “Super Cycling Man”, is aiming to ride around every continent as part of a massive five-year charity fundraising program. Dressed as Superman, Hodson has already set-off on his half-decade cycling journey from his home in the UK on Saturday, May 30. The former primary school teacher, is hoping to raise more than £100,000 for The World Cancer Research Fund, Parkinson’s UK, World Bicycle Relief and the cycling charity Sustrans. Hodson is updating his whereabouts and daily on Strava. “I have previously travelled the world in chunks by riding in the summer but the trouble was I didn’t want to stop,” he told the media. “I’ll be going all the time, riding 100km a day, until the Antarctic when I will have to come home to get an ice bike and warmer clothing. “I’m hoping to be in Istanbul and Asia come the end of August. Hodson says that the ride “is not a race as I want to enjoy the trip” and is staying in local communities each day to experience different cultures – though he is relying on the generosity on locals for accommodation. Speaking from his current location in Brussels, with 1,000 kilometers already under his belt, he explained how he has was invited to stay with a Belgian pop star called Raymond. “It’s as fun as it sounds. Everyone finds the outfit hilarious, you get old men and women in France shouting ‘Allez, allez, Superman!’,” he said. “There’s none of the cycling hatred we’re accustomed to – I get more space on the road; the solidarity of cycling is amazing. “I broke my rear spoke in France so went into a bike shop and they fixed it but refused payment. “I’m staying in communities and seeing the sights and friends, as well as linking up with local schools to give assemblies. The sight of the Tour de France peloton snaking its way up Alpe d’Huez next month, will undoubtedly be an inspiration for Hodson. “I’ve never ridden up Alpe d’Huez before so I am this time round. 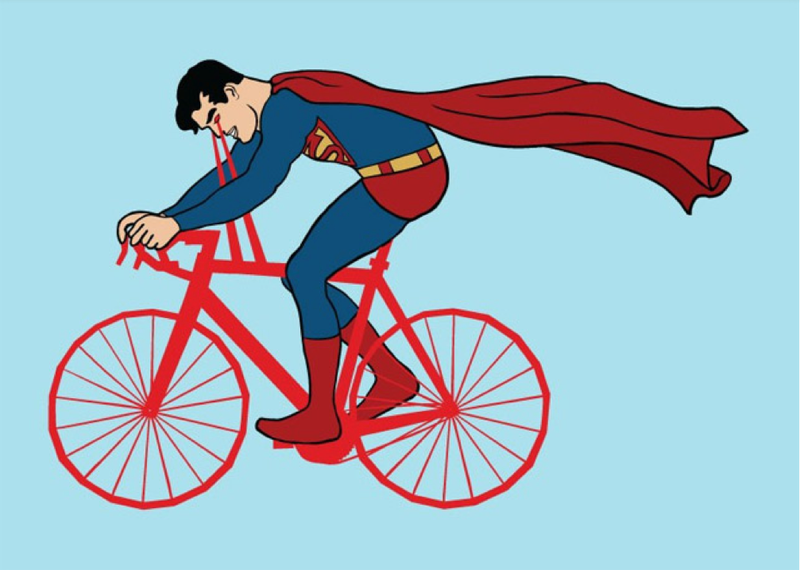 I doubt anyone dressed as Superman on a touring bike has ever ridden up it,” he laughed.